The Ferrari engineer sacked for leaking secrets to rivals McLaren says someone who is still with the team is to blame. The team's former performance director, Englishman Nigel Stepney, against whom Ferrari have launched a court case in Italy, insists he has been set up. "Someone gave away the designs but it wasn't me. Someone set me up and that person is still within Ferrari," he told Italian newspaper La Repubblica. As well as being sacked, Stepney faces criminal charges of alleged sabotage. Traces of a mysterious white powder were found in the petrol tanks of Ferrari cars before the Monaco Grand Prix, and the same substance was also found on his trousers. "They put the powder in my pocket while I was taking a shower." Stepney had hinted he was unhappy at being overlooked for the post of technical director when Ross Brawn left the team at the start of the season. He also said that once he had spoken of his unhappiness, he discovered some of his colleagues were also dissatisfied and were considering forming a breakaway team. "It would have been led by Ross Brawn," he said. Stepney also said he has already found a new job outside Italy and F1. 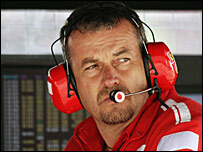 Stepney has been accused of leaking secrets to McLaren chief designer Mike Coughlan, who has been suspended by his team. With civil proceedings active, Stepney and Coughlan are under investigation for the theft of technical information from Ferrari. At a World Motor Sport Council meeting in Paris last week, McLaren escaped any immediate punishment over the spying row, as although they had confidential Ferrari documents, it could not be proved that they had benefited from that knowledge. However, the WMSC said it would ask Coughlan and Stepney to justify their actions in the affair. A 500-page dossier is understood to have since been discovered at Coughlan's Surrey home, but Stepney insists that he played no part in the leak of documents. "I have no idea how (Mike) got them, no idea at all," he told the Sunday Times newspaper earlier this month. "We met at the end of April in Spain just to catch-up between old friends." He revealed the meeting was witnessed by Mike Gascoyne, the technical director of Spyker. Stepney also backed up Honda's insistence that a meeting himself, Honda team boss Nick Fry and Coughlan was merely about possible employment opportunities. Max Mosley, president of FIA, has also said Honda were clear of any wrongdoing. "I went to Honda to discuss employment. At no time did Mike (Coughlan) offer any technical information to Nick. We didn't need to," added Stepney. Stepney also revealed that he has been forced to leave Italy with his wife and child due to fears over his safety. "There have been high-speed car chases. We've been followed by more than one car, with Italian plates, and when we cornered one of them last Thursday evening the men in it refused to speak," he told the Observer newspaper. "I don't believe they were journalists. There was tracking gear on my car. Someone was going to get hurt. I had no option but to get out of Italy." Stepney's lawyer Sonia Bartolini has previously indicated they would sue Ferrari for unfair dismissal. "We are going to fight this and it is to be expected that we will challenge Ferrari's actions in dismissing Nigel," she said.